Be sure to mark November 4 on your calendar because that is the day the revolution begins. Massive street demonstrations all over the country will drive the Fascist Trump/Pence regime out of power. At least, that is what the good people at Refuse Fascism hope will happen. In less than a week, it begins; in 19 cities across the country, we will unite with courage and conviction, overcoming fear and uncertainty, to put a stop to the grave danger that the Trump/Pence regime poses to the world. Only the people acting together in non-violent mass protest, raising the demand that this regime must step down from power, can end this nightmare. We are right to do this. For the survival of millions of people around the world, we must do this. For the rights of women to determine the course of their own lives, we must do this. For a future on this planet for all of our children, we must do this. If we don’t want to see white supremacist mob rule, in the government or in the streets, we must do this. For every group that is demonized and targeted by this regime, for whom this regime is already a brutal nightmare, we must do this. Our actions reflect the values of respect for all of humanity and the world we want – in stark contrast to the hate and bigotry of the Trump/Pence fascist regime. 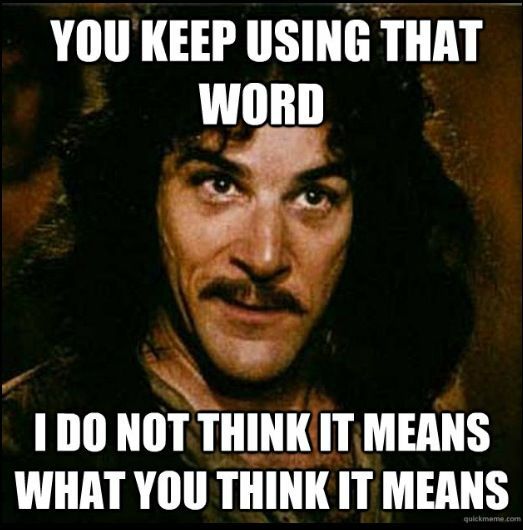 These days, whenever I see someone using the word “Fascism”, I cannot help but think of Inigo Montoya’s line from the Princess Bride. I do not think they have the slightest idea what Fascism actually is. Politically, a Fascist state is a one party totalitarian state ruled by a charismatic dictator, in which the government claims total control over the lives of the citizen’s while those citizens have no rights the government is obliged to respect. Fascist economic policy is essentially anti-free market Socialism that while permitting private ownership of the economy controls it to such an extent that such ownership is largely nominal. Is Trump a Fascist? Of course not. Trump has not suspended the constitution, abolished opposition parties, thrown dissidents in prison, or anything or the sort. Like it or not Donald Trump won the election and is the duly elected President of the United States. Setting aside his often ill-conceived words, Trump’s actions as president have been entirely what one might expect of a slightly right of center president. If Donald Trump weren’t Trump, little of what he is doing would be controversial. There are no mainstream figures in American politics who could even remotely be considered Fascists. There is no American Fascist Party. There are no politicians describing themselves as Fascists. The people who claiming to be fighting Fascism can go home. They have no one to fight. I have to wonder what groups like Refuse Fascism hope to accomplish with these protests. The President’s term of office is set by the constitution at four years. Unless Donald Trump is impeached and convicted of a crime or resigns, he will be president in 2020 regardless of how many people are protesting against him. There is no constitutional provision for a do-over election. If both Donald Trump and Mike Pence resign or are removed from office, there is a clear line of succession established by the Presidential Succession Act of 1947. If the President and Vice-President are unable to serve, then the Speaker of the House Republican Paul Ryan becomes President. The Senate President Pro Tempore, Republican Orrin Hatch is next, followed by the Cabinet Secretaries, all appointed by Trump, in order of the creation of their department. There is no legal or constitutional means by which Hilary Clinton or Bernie Sanders gets to be president, even if both Trump and Pence are removed. At present every single person in the line of succession is a Republican, and presumably part of the Fascist regime. This will only change if the Democrats gain a majority in either House of Congress in the 2018 midterms. Given that even impeaching Trump and Pence would only result in other members of the Fascist regime becoming president, there is no legal, constitutional way to remove the Fascist regime. How, precisely do they plan to go about it non-violently, and how are we supposed to select a new president, given that the constitution will have been discarded? Is it the plan to force a democratically elected president and his cabinet from power and replace him with a leader chosen by a mob? Ironic is a word that is overused but there is something ironic going on here, since these people don’t seem to have studied history at all. Overthrowing an elected government by the threat of mob violence is precisely what Benito Mussolini did with his March on Rome in 1922 and Adolf Hitler tried to tried to do with his Beer Hall Putsch in 1923. When you consider the very real possibility of violence breaking out at some of these anti-Fascist protests, based on the past history of violence by the Antifa, it might seem that the real Fascists are the ones protesting Fascism. There is the irony. Refuse Fascism will not be able to force Donald Trump from the Presidency, but if they manage to create an atmosphere of disorder and chaos by continuous, daily, possibly violent, demonstrations they will succeed in creating the atmosphere that a real dictator can take over. Again, if they had actually bothered to study history, they would know that Fascist dictators like Mussolini and Hitler were preceded by chaotic, lawless conditions in their respective countries. If regular, constitutional government cannot maintain the order people need to live their lives, they will turn to the strongman who can. If the people planning to protest this Saturday really wanted to fight Fascism, they would protest Trump’s policies while acknowledging that he is the legitimate President and not a dictator. They would be putting their efforts into recruiting candidates for office in the upcoming elections and seeing to it that he is a one-term president. But, that would take knowledge and maturity, two characteristics not often associated with the Left. It’s easier just to have a giant temper tantrum. Biden says President Trump’s behavior ‘absolutely bizarre’ (wtnh.com) He’s one to talk.